Following is my whimsical version of Patrick’s biography. If you prefer a straightforward factual one, please see his ISU biography or his Canadian Olympic Team page or even his Wikipedia page. Once upon a time in Canada, an ice prince named Patrick Lewis Wai-Kuan Chan was born into a Chinese immigrant family on New Year’s Eve. Despite his most appropriate arrival during the dead of winter, his parents had no idea of his magical powers on ice until he turned age five, when he asked to learn hockey. His mom signed him up for figure skating instead. By age 10, he had won his first medal at the Canadian Junior National Championships. My body was built to be a figure skater, and not a hockey player. I believe that skating is something I was born to do, something I have to do. Trained by legendary master Osborne Colson, young Patrick learned to make intricate carvings on ice with his smooth and deep edges, all while gliding across the ice at an astonishing speed with the flow generated from his knees. It was not long before he could mesmerize others with his magical powers. 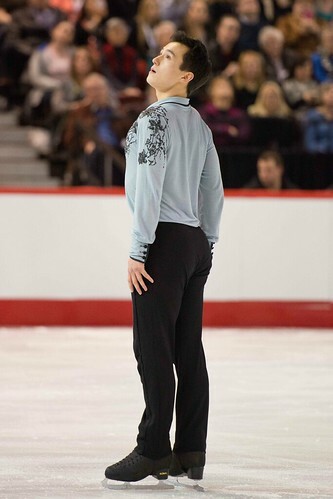 At age 14, he became the youngest skater to compete at the World Junior Championships. I love the hits, the thump when you land. And I love hearing the ice cut, the crackle, as you push into it. “Someday you will meet the highest rulers of the land,” declared his master. Patrick set about preparing to go to the games of the gods on Mount Olympus – the tallest mountain in the world. The path there would be difficult and arduous; most mortals never reached it. But Patrick persisted and won the crown of Canada thrice. He attempted to claim the title of Champion at the World Ice Games, but it eluded him. Nevertheless, he was summoned to Mount Olympus to compete for the elusive gold dust of the gods craved by every ice prince and princess. At the Olympic Games, each athlete was required to not only perform well in their respective competitions, but to scale Mount Olympus itself. The gods rewarded those who reached the summit first with a bag of gold dust. Runners-up received a bag of silver, and second runners-up, bronze. All others received no prize except for the consolation of Athena, the goddess of wisdom. Patrick’s first attempt to scale Mount Olympus was not as successful as he had hoped – he was fifth to reach the summit. The experience so demoralized him that he pondered quitting his quest, but Athena sent the ice muses to assure him, and so he continued his journey. Patrick made preparations for his next Olympic Games with a renewed vigor. 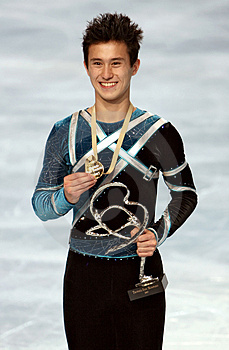 He improved and went on to win three competitions against the best skaters of the world. Excitement grew as the next quest to Mount Olympus neared – surely this time he would obtain the gold dust that had eluded every Canadian ice prince since the games began! But when he neared the summit of the mountain, his strength was nearly spent and he was unable to overtake his rival. Nevertheless, the gods took pity and awarded him two bags of silver dust for his efforts. He went home and rested for a year, with many thinking he would never resume his quest again. The way I move is unique and is what makes me me on the ice and what makes my skating stand out in its own way. But Patrick did return to start yet another rocky journey to Mount Olympus. He began with much trepidation, having forgotten the anguish and sorrows of competition. After an early victory over rivals, he found to his dismay that his quest had become more difficult. Younger men attempted more gravity-defying moves on ice in order to please the gods. Patrick feared that the magic of traditional ice carving would be lost to acrobatics. But most of all, he feared that he no longer belonged in a new era of skaters. Some wondered if he would retire from his quest at age 25. To their relief, the answer was no. I love figure skating and what I am able to express creatively. I want to leave a legacy in the sport. Now, Patrick is on his final journey to Mount Olympus. Whether he succeeds in his hunt for gold or not, he is already a legend. He has also pledged to teach a new generation of ice magicians and pass the torch on to them. I wish him the very best in his quest………..
UPDATE 2/2018! Patrick climbed the first Olympic mountain together with his teammates and succeeded! Now he gets to add Olympic Gold Medalist to his biography! Now he has also truly fulfilled his Chinese name, 偉群, which means “Great Group”!